If you look toward the middle of the map, you can see a big red oval over the center of the New Madrid fault zone. Most Americans don’t realize this, but the most powerful earthquakes in U.S. history did not happen in California. Rather, they actually occurred along the New Madrid Fault zone in 1811 and 1812. Documents from that time indicate that those earthquakes were so powerful that they were felt more than 1,000 miles away. If you are not familiar with it, the New Madrid fault zone covers parts of Illinois, Indiana, Missouri, Arkansas, Kentucky, Tennessee and Mississippi. If an earthquake similar to the quakes of 1811 and 1812 were to happen today, it would destroy structures all the way up to the Great Lakes and all the way down to the Gulf of Mexico. Walmart Stores Inc., with its huge network of stores and facilities, has also taken note. “We are seeing increased earthquake activity in the central U.S. That is an area we are focusing on even more,” said Mark Cooper, senior director of emergency management at Walmart, in an interview. He explained that Walmart takes an “all-hazard” approach to emergency preparedness, but focuses on specific risks in areas of the country where those risks are particularly relevant, such as hurricanes in Louisiana. “A few weeks ago, we participated in an exercise to prepare for an earthquake on the New Madrid fault line,” he said. According to the USGS, the frequency of earthquakes in the central and eastern U.S. has quintupled, to an average of 100 a year during the 2011-2013 period, up from only 20 per year during the 30-year period to 2000. Most of these quakes were minor, but research published by the USGS earlier this year demonstrated that a relatively minor magnitude 5.0 quake caused by wastewater injection after conventional oil drilling triggered a much bigger, 5.7 magnitude quake in Prague, Okla.
“We know the hazard has increased for small and moderate size earthquakes. We don’t know as well how much the hazard has increased for large earthquakes. Our suspicion is it has but we are working on understanding this,” said William Ellsworth, a scientist with the USGS. The midwest region is preparing for earthquakes that are bigger and more powerful than ever believed imaginable. 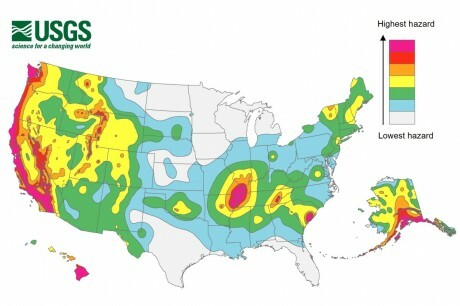 The U.S. Geological Survey updated their seismic hazards map last week, and in it, Kentucky is listed as one of 16 states at highest risk of earthquakes. USGS says the New Madrid Fault, which runs through a number of midwestern states, has been identified as an area that has potential for larger and more powerful quakes than previously thought. Accounts of the 1812 quake vary since there were no measuring instruments at the time, but most geologists say evidence shows it was at least a magnitude 8 earthquake, and possibly a 9 or higher. The shaking was so intense that church bells started ringing as far away as Boston and New York. Chimneys toppled from the Deep South to Canada, and President James Madison was awoken by the violent shaking as he slept in the White House. Eyewitnesses said it even caused the Mississippi River to flow backwards for a time. At that time, the New Madrid region was sparsely populated. But today, tens of millions of people live there, and most buildings have not been built to withstand massive earthquakes. So what would a magnitude 8 or a magnitude 9 earthquake look like? And most people don’t realize that there are 15 nuclear reactors along the New Madrid fault zone. In the event of a major earthquake, we could have multiple “Fukushimas” all going on at the same time. Let us hope that it is a very long time before a disaster such as this strikes. But as I mentioned above, earthquake activity in the central part of the country has increased dramatically in recent years. And Wal-Mart is so concerned that it actually participated “in an exercise to prepare for an earthquake on the New Madrid fault line” just a few weeks ago. So let us hope for the best, but let us also not be blind to the warnings signs all around us.